It is a little late in coming, but here is my race report. I have also posted (along with many others) about the race on Active.com and Steve included an audio report from me in Episode 219 of Phedippidations. The weather was very nearly perfect. 37 degrees at the start, with just a little wind (gusty, 8mph) that would crop up from time to time during the day. Erin was up with me at 5AM and rode the shuttle to the race start at Bolles. I noted to her that the last time I rode a bus to Bolles, I was on the high school swim team and we got clobbered. Started the day with a coffee and Snickers energy bar and ran around the start area for a quick warm up, listening to Eminem’s “Lose Yourself” and the Dropkick Murphy’s “I’m Shipping up to Boston” on to get me in the mindset for my hopeful BQ. Erin walked with me over to the start line. I took a nervous run up and down the starting chute as people began to fill in the area. 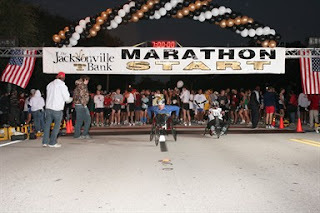 The Jax Marathon is a small, flat, shaded course that is very fast and billed as a great race for Floridians to get their BQ. In fact, when I stopped at 1st Place Sports to pick up my race packet, there were more than a few people milling about in their Boston gear. At first I was a little annoyed, thinking that it was kind of arrogant to do, but ultimately I figured that if they had run the race it was their prerogative to wear the gear. I think, however, that if BQ and get any Boston gear, I will not likely do the same. For a 31 year old man, the BQ time is 3:10:59 and my previous PR was 3:20 at the Virginia Beach Shamrock Marathon in March of 2008. Anyway, on race morning, the course was not very crowded. While there was a concurrent start for the half marathon, only 750 toed the line for the 26.2 and 1214 for the half. Pace groups were provided but none faster than 3 hours and 30 minutes. They fired the cannon at 7:05 and 3 seconds later, I crossed the start. I knew that my goal pace was going to be 7:08 per mile. So I was a little anxious when I did the first mile in 6:50. But I felt strong so I decided to try to maintain that pace and bank a few minutes for the back end of the race if I bonked. Things went pretty smoothly and at the 10K mark, the herd thinned as the half marathoners turned around. The course support was excellent considering the few marathon runners. Despite getting spread out, I still was always able to tell where I needed to turn and the police did an excellent job of traffic control. My trouble started at about the halfway point when I began getting respiratory cramps under my ribs. A little belly breathing helped solve it, but the cramps would return a couple more times during the race. They got particularly bad around mile 19, when I elected to take a walk break and enjoy a caffeinated gel pack. From that point to the end, I started fading. My cardiovascular fitness was fine, but the legs just didn’t want to go as fast as I wanted to. My pace slowed, 7:00, then 7:15, 7:30. I took a walk break on one mile at added an 8:30. What kept me going was the math. When I was running 6:50’s, I thought “Wow, I could even break 3 hours!”. Once the legs gave me grief, I knew that was out the window, but all the banked time meant I could focus on consistency and making my primary goal of a BQ. At 20 miles, I had nearly about 50 minutes left to make the BQ. At 22, I had 35. At 24, I had like 20 minutes, and at 25, I had 13. Each one meant I had more and more spare time to make the BQ, which kept a smile on my face and my legs turning over. The last ½ mile, the course turns off the roads and goes over some loose gravel, which I must say was troublesome to navigate, given the fatigue. 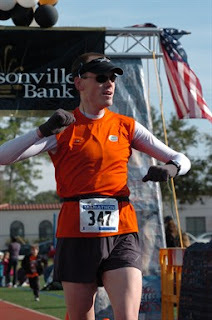 Then the course turns onto the Bolles track, where one half lap leads into the finish chute where my wife had told some of the other spectators to look for me. Despite the announcer missing my name, several people were yelling Dave as I broke the tape with 3:06:50 (3:06:47 chiptime). The spectators are lovely people. Somewhat sparse on the course, but serving margaritas, fresh oranges, and other goodies. I felt like the police did a great job keeping people off the course (although a car or two did sneak on here and there). I heard that some people had trouble with the shuttles, but my travel was just fine. I definitely recommend the race to anyone looking for a potential BQ, and it is a nice look at the ‘burbs of a big Florida city. Thanks to 1st Place Sports for the accommodations!